Benjamin Franklin Plumbing is College Station's emergency plumber. Benjamin Franklin Plumbing College Station, the Punctual Plumber, offers the best plumbing services and water heater replacement in the Bryan-College Station areas. Emergency plumbing guide provided by Benjamin Franklin Plumbing College Station. Benjamin Franklin Plumbing College Station serves the Bryan/College Station, Texas area with a team of certified plumbers. In addition to emergency plumbing repair, some of the plumbing services provided by the company include: faucet repair, drain services, toilet repair, plumbing fixture installations, tub and shower installations, kitchen sink repair, faucet installation, water heater repair/replacement, and garbage disposal replacement. Call us today at (979) 704-6185 to schedule an appointment! Water heater replacement guide provided by Benjamin Franklin Plumbing College Station. Benjamin Franklin Plumbing College Station serves the Bryan-College Station, Texas area with a team of certified plumbers. 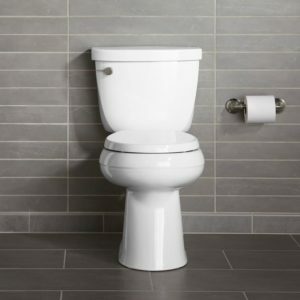 In addition to emergency plumbing repair, some of the plumbing services provided by the company include: faucet repair, drain services, toilet repair, plumbing fixture installations, tub and shower installations, kitchen sink repair, faucet installation, water heater repair/replacement, and garbage disposal replacement. Call us today at (979) 704-6185 to schedule an appointment! In general, water heaters are only made to last 8-10 years. If you don’t know how old your unit is, you can find the age by looking for the serial number on the manufacturer’s sticker on the upper portion of the tank. The serial number contains the manufacture date, written as a date code such as "F051052638". The letter is for the month - F is the sixth letter in the alphabet, so it represents the sixth month, June. Next, the first two digits of the serial number are 05, representing the year, 2005. So this water heater was made in June 2005. Each manufacturer has a similar date code, but they can vary, so check the manufacturer’s website to learn more. If you find rusty water coming from your water heater, this can be a sign that your unit is rusting away on the inside. To avoid replacing a functioning unit, be sure to check that it is actually the tank, and not the piping, that is rusting. As a water heater ages, sediment will build up and harden on the bottom of the tank. When this happens, you can often hear rumbling or banging sounds coming from the tank. This could be a sign that the unit is at the end of its useful life. If you start to hear rumbling from your water heater, keep an eye out for any small leaks. If you find one, then it may be time to replace your unit. If you notice moisture around your water heater, you may have a small leak or a fracture in the tank. As the metal heats, it expands and if there are slight fractures, water may leak from the tank. Once the metal has cooled the inner tank will stop leaking. Before replacing your unit, make sure there are no other leaks coming from either the fittings or connections to the tank. If you are concerned about water heater failure or if you discover any of the signs above, contact Benjamin Franklin Plumbing today! Do you have a toilet problem? One that won’t stop running? Is it continuously filling and keeping you awake at night? We see these symptoms all the time and most homeowners will encounter a similar toilet problem at some point. The simple explanation for this issue is that the flapper is not closing correctly, so water is constantly leaking from the tank to the bowl. The flapper controls the water flow from the tank into the toilet bowl. Over time, the flapper can become dirty, damaged, discolored or warped. This allows water to leak from the tank. If your flapper looks damaged or broken, it is probably time to fix the toilet problem and install a replacement. The chain connects the flush lever to the flapper. 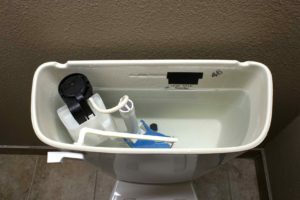 When you push down on the lever to flush the toilet, it should lift the flapper with the chain, allowing water to rush from the tank to the bowl. However, if your chain is broken or too short, the flapper will stay up and water will leak from the tank. This can require a simple toilet repair to fix. Your toilet may have a plastic, rubber, or metal balloon-like object attached to the fill valve, floating on top of the water in the tank. This float serves as a sensor for the fill valve. When the float is low, the valve will open to allow water into the tank. Once the float rises to its normal position, the valve will shut off the water flow. If the float is malfunctioning, the water won’t replenish as it should, and you’ll have a toilet problem that needs to be repaired as soon as possible. Do you still need help figuring out why your toilet keeps running? Or maybe you have another toilet problem? Leaky toilets can be annoying for homeowners. The experts at Benjamin Franklin Plumbing can help ease your frustration and quiet your bathroom. We’ll get to the bottom of your toilet repair need quickly. Benjamin Franklin Plumbers are highly trained and experienced plumbing repair experts. We know your time is valuable so when you call a Benjamin Franklin Plumbing expert, you won’t wait long for plumbing service. We are ready 24/7 to solve your plumbing problems or assist with your new installations. At Benjamin Franklin, we are the Punctual Plumber. You’ll be delighted with our fast, courteous, and professional service. If you are experiencing toilet repair problems or have any other plumbing issues, give us a call today. Benjamin Franklin Plumbing College Station provides some helpful BCS plumber tips. Every month we like to take a look at specific elements in the home, like faucet repairs, that often require a call for plumbing repairs in College Station. Faucets can be found in kitchens, bathrooms, laundry rooms and entertainment rooms, and the demand for College Station faucet repairs seems endless. Often times, customers are surprised at just how extensive our plumbing repair services are, and how wide our reach is in the home. There are very few rooms in the home that we don’t work in. Dripping faucets will end up wasting lots of money and water over time. Not tackling the problem immediately can quickly ramp up your water bills. If you have a leaky faucet that needs faucet repair, your best bet would be to call Benjamin Franklin Plumbing College Station. Not only can an experienced Benjamin Franklin Plumber determine your problem, but often in a short amount of time, they can efficiently resolve the issue – saving you additional time and money. The reasons for faucet repairs are varied. In order for us to pinpoint whether your faucet repair will require simply switching out a washer, or a more complex faucet repair involving valve body repairs, can be determined upon an inspection by our qualified Benjamin Franklin Plumbing College Station. Benjamin Franklin Plumbers are highly trained and experienced plumbing repair experts. We will not leave you waiting for plumbing service, and we are always available for a College Station faucet repair or any other plumbing service you may need. Benjamin Franklin Plumbing will always be on-time for a scheduled appointment – we guarantee it! If you are currently experiencing faucet problems, or want to have a new faucet installed, give us a call! Benjamin Franklin Plumbing College Station serves the Bryan/College Station, Texas area with a team of certified plumbers. In addition to emergency plumbing repair, some of the plumbing services provided by the company include: faucet repair, drain services, toilet repair, plumbing fixture installations, tub and shower installations, kitchen sink repair, faucet installation, water heater repair/replacement, and garbage disposal replacement. Call us today at (979) 383-2084 to schedule an appointment! Looking For A College Station Plumbing Company? Looking for a College Station plumbing company? Think Benjamin Franklin Plumbing College Station, when you need a plumbing repair service in College Station, TX. Here is some information to remember when you have plumbing problems and need to find a plumber in College Station, TX. Need A College Station Plumber? Finding a College Station plumber that has both skilled and trustworthy plumbers can be a challenge. That’s why we encourage you Finding a College Station plumber that has both skilled and trustworthy plumbers can be a challenge. That’s why we encourage you to reach out to Benjamin Franklin Plumbing College Station, the best and most reliable plumber in the College Station area. What Makes Us The Best College Station Plumber? At Benjamin Franklin Plumbing College Station, we know that the quality of our plumbing service begins and ends with the quality of our service techs. Our College Station plumbers are selected based on their experience, education and personality, as well. We only hire clean cut, respectful and knowledgeable plumbers. Furthermore, Benjamin Franklin's College Station plumbers undergo a rigorous screening process as well as ongoing training to ensure that they remain knowledgeable on the ever developing trade. Our College Station plumbers perform many different tasks including repairs, replacements and inspections. With this wide range of service offerings, we can be your one stop shop. From unclogging a tub to installing a new garbage disposal – we are able to do it all. We truly care about our customers and their Benjamin Franklin Plumbing experience. And we understand that your time is valuable. That’s why we pay you if we run late for an appointment. That is our Benjamin Franklin promise – to be on time every time. We also guarantee our work! So if you are looking for a College Station plumbing company, give us a call and see how we can help you! Benjamin Franklin Plumbing College Station is available 24/7 for any emergency plumbing problem you have. What ever disaster comes your way - remember Benjamin Franklin Plumbing when you need emergency plumbing in College Station, TX.